Basically all humans have an ego. Family, environment, status, economy, education, the treatment and the words of others, certain events and the things that are intensely repeated in one’s life, can be shape and predispose the ego. In Greek, “ego” means “I, me, my” (a primary pronoun of the first person I – only expressed when emphatic). Simply put, the ego is a perspective on self or an individual’s concept of self, or “A person’s sense of self-esteem or self-importance”. How we respond, react, and act against everything is a manifestation of our ego. Therefore as disciples of Christ we must see ourselves in God’s perspective so that we have the same self-concept as God’s concept of ourselves, and as much as we can avoid falling into sin caused by the ego. Jesus knows exactly who He is. He knew exactly the purpose of his life, and in his obedience He had accomplished the Father’s work perfectly. That’s our longing, right?! Everyone who truly loves God will want to understand God’s will, to be used by Him, and to experience the fulfillment of His plan. But that is often hindered by our-selves alone (the ego). The “I AM” factor with all the attributes and peculiarities that stick to us – character, nature, perspective, strength, weakness, and so on – often makes us give the wrong response. Consequently, we fail to understand God’s intentions, fail to recognize His call, be confused and don’t understand His will, even acting wrongly. Since we were born and grow, along with it the ego is evolving. Then when we meet Christ, there will be alignment. That is our self is more aligned with the Word of God. The parts of us (the ego) that are wrong must be corrected, the impure must be cleaned, the deviate must be straightened, the useless must be removed. When we believe and accept Christ as the only God and Savior, at once we become new creatures: “Therefore, if anyone is in Christ, he is a new creation; the old has gone, the new has come! (2 Corinthians 5:17 NIV) But that doesn’t mean automatically our entire existence will change instantly. There are things that require our cooperation to respond appropriately to any process of God. It is all God’s perspective on His children. As His children, we must see ourselves just as the Father sees us. We must have and live the restored self-concept. Our paradigm in looking at ourselves and this life must be change. Transformed by the renewing of mind means we have to change in thought, feeling, and will. The measure of good or bad, right or wrong, profit or loss, worthy or not, etc., is no longer ourselves alone (ego) but God’s word! 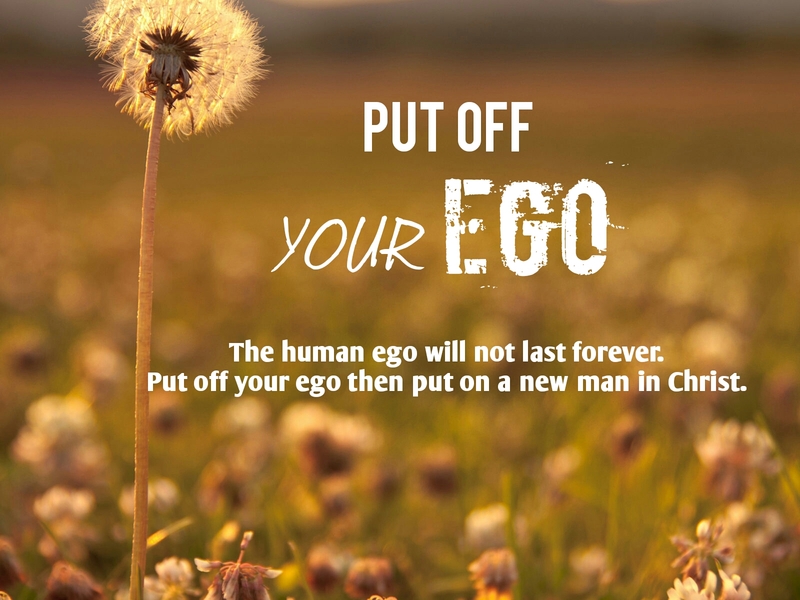 In that way, from time to time our ego will become increasingly eroded and God’s plan in our lives can be accomplished. As a people who should live as Christ did, then we must imitate what Jesus did. In Matthew 4: 1-11, Jesus was tempted by Satan after He finished 40 days 40 nights fasting. When we note, the essence of the first and second trials is not just about bread or about throw self down, but Satan manipulated and challenged Jesus to prove Himself and His power as Son of God. The key to Jesus’ triumph over temptation is that He always submit Himself under the authority of God’s Word. If we are going to win over temptation then WE MUST BE SUBMIT OUR EGO UNDER THE AUTHORITY OF GOD’S WORD. Our standard of living and responding to everything is not the ego, but God’s Word! Similarly, when Jesus prayed in the garden of Gethsemane before His crucifixion. Three times Jesus prayed, And He said, “Abba, Father, all things are possible for You. Take this cup away from Me; nevertheless, not what I will, but what You will.” (Mark 14:36 NKJV) Jesus declare that nothing is impossible for the Father. Jesus believed the Father must be able to grant His request, but Jesus submit Himself to the Father’s will. If we desire to live in God’s plan, then OUR EGO SHOULD BE SUBMITTED TO THE GOD’S WILL. Our standard in reacting to everything is not our thoughts, feelings, and will, but God’s will, because sometimes our ego pushes us into doing something we think is right but it is not true or not God’s desired way, as Moses did. If we read in Exodus 2: 11-15, Moses acted to defend his people, Israel, by killing the Egyptians who were beating a Hebrew. It was easy for Moses to do that because he was educated and trained in the palace of Pharaoh. Should defend his people is the right attitude, but because the timing and the way was not right then what happenned was a misunderstanding. He was rejected by his own people and sought after by Pharaoh to be killed. Our ego must always be submitted under God’s authority, that is the Word and His will, even when we want to do the right thing in our eyes! If the ego is not submitted and handled, we can be a selfish person who measures everything from the standpoint of oneself and for oneself. Ultimately, the whole value of our lives comes from God. Our life will be meaningful and fruitful if it is founded on the foundation of faith in Jesus Christ and built according to God’s plan. Do not let the ego prevent us from entering into it. The apostle Paul is a wonderful example. Paul didn’t boast of himself as a capable man. He also didn’t argue with God. All he did is obey: But when God, who set me apart from birth and called me by his grace, was pleased to reveal his Son in me so that I might preach him among the Gentiles, I did not consult any man, nor did I go up to Jerusalem to see those who were apostles before I was, but I went immediately into Arabia and later returned to Damascus.” (Gal 1:15-16 NKJV) Even though in the early days of his ministry he had been questioned by apostles and Jewish Christians, he continued to walk and work on God’s call until his last breath at the hands of Emperor Nero’s executioner in Rome. That is the life that fulfills God’s plan. Let us PUT OFF THE EGO OF OUR OLD SELF. Do not feel great, capable, and confident because of rich, clever, have power, handsome or beautiful, talented, influential, and many advantages. Also do not feel inferior because of feel ugly, poor, stupid, and many weaknesses. Don’t rely on our sense of self-esteem or self-importance based on all of that! Rather, let us live in THE NEW ATTITUDE OF OUR MIND AND PUT ON THE NEW SELF IN JESUS CHRIST, also live in THE TRUE RIGHTEOUSNESS AND HOLINESS, which are values that are not measured by our own perspective and our sense of self-esteem or self-importance, but based on what God says. Certainly not by relying on our own strength and effort, but by relying on the guidance of the Holy Spirit all the time and continuously, until the whole process of our lives ends, that is, when we close our eyes forever to return to the Father, the owner of our life. This entry was posted on October 23, 2017, in Christianity, Thought and tagged A new man, Apostle, authority, Benjamin, christianity, confidence, ego, egoistic, feeling, Gamaliel, Gentiles, God, God's plan, God's will, God's word, Jesus, Jewish, Judaism, Life, light, Lord, moses, obey, old self, Paul, Pharisee, self-esteem, self-importance, submit, temptation, The Son of God, thought, transformation. Bookmark the permalink.